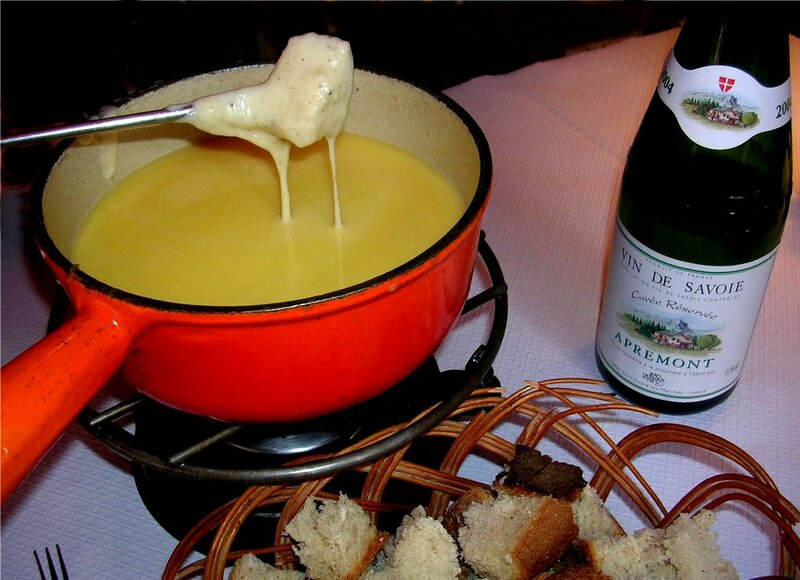 - The cheese fondue set consisting of the earthenware or enamel coated sauce pan, the chafing-dish, the six long thin forks of different colors. Each person will choose a color so as not to mix them up. - 800 gms of Emmenthal, Comté, and/or Gruyère cut in very thin slices. - 4 cups of a dry white wine. - 4 Tbsp. of Kirsch. - Freshly ground white pepper. - 1 tsp. corn flour. - 1 clove of garlic crushed to a paste. - Basket of stale bread cut in cubes. Fresh bread will disintegrate in the cheese. - Rub the bottom and sides of the sauce pan with the garlic paste. - Add the cheese slices and the wine to the sauce pan on a double boiler. Stir incessantly till all the cheese has turned into a creamy melt. - Add the corn starch to the Kirsch, dissolve, and add to the creamy melt. Keep stirring till you obtain a thickish mixture. - Set the sauce pan on a chafing-dish to keep warm and the cheese melted. - Every person will take a cube of bread with a long fork and dip into the cheese covering it completely. Now, because this dish consists of only cheese, various salamies, and hams, together with baby boiled potatoes can be served on the side. Suggested wine: a dry but aromatic white wine. * Recipe Proposed by Hélène Vincent. P.S. You can find a ready made fondue in a sachet in any super market and save yourself all the trouble above!! But it would not be fun would it? ?